Merit Badges and the Cultural History of the U.S. « Adafruit Industries – Makers, hackers, artists, designers and engineers! At first glance, there’s something undeniably old fashioned about the Girl Scouts and the Boy Scouts. The organizations have legacies that stretch back more than a hundred years to the days when boys were taught to tramp through the woods and girls were taught to keep a tidy home. Today some 4 million kids still wear those iconic cloth sashes dotted with merit badges—a tradition first introduced by the Boy Scouts in 1911 and the Girl Scouts in 1912. But if you look more closely at each embroidered round, you’ll discover that the scouts have been anything but static over the last century. The ever-changing roster of Girl Scout and Boy Scout merit badges forms an accidental history of American childhood, a record of what it has meant for girls and boys to “be prepared”—the eternal scouting motto—through two world wars, the Cold War and the War on Terror, through the birth of television, the dawn of the Space Age and the arrival of the internet. Often these boys and girls were our advance scouts: Boys earned a merit badge in automobiling in 1911, when barely one percent of the population owned a car. Girls earned one in Civics in preparation for the vote; it was renamed the Citizen badge with the ratification of the 19th amendment in 1920. 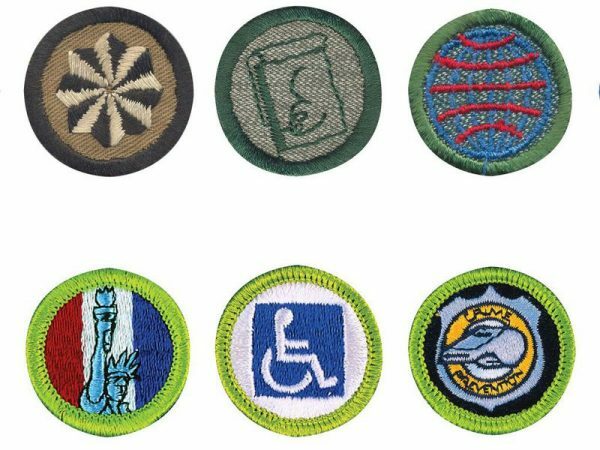 Comments Off on Merit Badges and the Cultural History of the U.S.